These terms and conditions apply to all Trust participants in Battle of the Breakfast Clubs. By entering Battle of the Breakfast Clubs, Trust Participants accept these terms and conditions together with any specific instructions and terms for such Battle which may be mentioned in any electronic messages, on the website, or communicated to Trust Participants in any other way (“competition information”). Such competition information shall prevail in the event of there being any inconsistency between these competition terms and conditions and any competition information. The Trust and EXOS may cancel or amend any competition, competition information, or these terms and conditions without prior notice.Any changes will be posted either within the competition information or these terms and conditions. 11 Breakfast Clubs will compete against each other to win the Battle of the Breakfast Clubs. Each Trust Participant from the winning Breakfast Club will receive a Grand Prize package, subject to the conditions below. A Trust Participant must participate in at least four (4) full weeks of the six (6) week Breakfast Club to be eligible to receive the Grand Prize package awarded to the winning Breakfast Club city. A Trust Participant must complete entry and exit evaluations to contribute to the team metrics in order to be eligible for the Grand Prize package. A Trust Participant may opt-out of the Battle of the Breakfast Clubs if he wishes, but still participate in the Breakfast Club in his city but will not be eligible for the Grand Prize package to the winning Breakfast Club city. Any Trust Participant must comply with any directions given to him by EXOS including but not limited to any and all relevant laws, rules and applicable regulatory codes. Each Trust Participant from the winning Breakfast Club will receive a Grand Prize package, worth over $1,000. Over the course of Battle of the Breakfast Clubs, Trust Participants may be photographed, filmed and be recognized through Social Media platforms by The Trust and/or EXOS, and Trust Participants agree to such activity, and understand The Trust shall be the sole owner of the photographs and/or videography (if applicable). 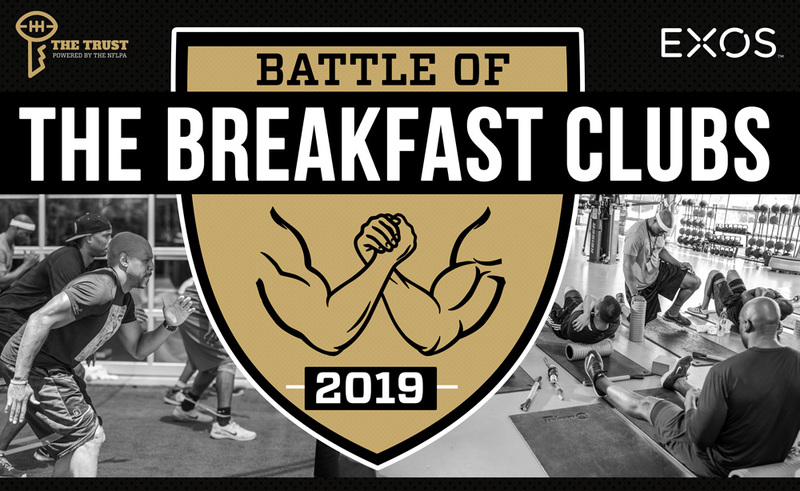 The process for determining the Battle of the Breakfast Clubs winning city will be provided to Trust Participants at the start of their respective Breakfast Club and the winning Breakfast Club team will be notified in September 2019. Trust Participant winners will be contacted on the phone number, by SMS text, or email address provided when entering the competition. Each winner will have a specified fixed time period in which to claim his prize. If EXOS is unable to notify the winner, or if the winner fails to respond within the fixed time period as specified and/or provide an address for delivery of the prize, this may result in forfeiture of the prize. The Trust and EXOS reserve the right to modify, cancel, terminate or suspend the Battle of the Breakfast Clubs in whole or in part, at their sole discretion, if they believe the Competition is not capable of being conducted as specified in these terms and conditions or in the event of a virus, computer bug or unauthorized human intervention or any other cause that is beyond the reasonable control of The Trust and EXOS, that could corrupt or affect the administration, security, impartiality, or normal course of the Competition. No cash equivalent or alternative prize will be given and the prize is non-transferable and non-exchangeable. However, EXOS reserves the right to change the prize due to circumstances beyond its control or to offer an alternative of similar value. In relation to the Competition, the name of the winners may be published by The Trust and Trust Participants grant to The Trust an exclusive license to use and publish their name in any media for the purpose of announcing the winner. For and in consideration of the Grand Prize, Trust Participant agrees to release, discharge, absolve, and hold The Trust and/or EXOS, their parent(s), subsidiaries, affiliated entities, licensees, shareholders, members, officers, directors employees, agents, attorneys, successors and assigns harmless from any and all claims, demands, actions, suits, losses, expenses, costs and liabilities of every kind, whether arising out of contract, tort, statute or otherwise, in law or in equity, which Trust Participants, or Trust Participant’s respective agents, attorneys, successor or assigns, or other third parties may have against The Trust and/or EXOS, their parent(s), subsidiaries, affiliated entities, licensees, shareholders, members, officers, directors, employees, agents, attorneys, successors and assigns, regarding or relating to the Battle of the Breakfast Clubs, the Competition, or the Grand Prize.Trust Participant further acknowledges that The Trust nor EXOS has not made any representations or warranties with respect to the Grand Prize. The Trust and EXOS are not responsible and shall not be liable for any damage, loss, injury or disappointment suffered by any Trust Participant entering the Battle of the Breakfast Clubscompetition or as a result of accepting any prize. The Trust and EXOS are not responsible for any problems or technical malfunction of any telephone network or lines, computer on-line systems, servers, or providers, computer equipment, software failure of any email. The Trust and EXOS are similarly not be liable in the event that all or any part of the service relating to the competition is discontinued, modified or changed in any way.